Bill Waring, collecting his wits in hospital after a train crash, receives only one letter from his fiancee, Lila Dryden. When he discovers Lady Dryden, Lila's guardian has pressured her into an engagement with Herbert Whitall, he is furious. Herbert Whitall is aggressive, with a cold-hearted possessiveness that includes Lila and his ivory collection. His employees hate him, Lila is terrified of him and he seems to have some sort of hold over Lady Dryden. When an ivory dagger from his collection becomes the instrument of his death there are numerous suspects. Lady Dryden calls on Miss Silver for help. 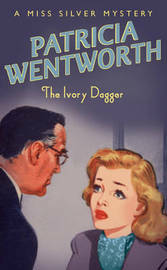 The Ivory Dagger was my introduction to Miss Maud Silver - spinster, retired governess, now turned private detective. Her quiet, unobtrusive presence allows her to sit virtually unnoticed and apparently concentrating on her knitting, while she observes carefully everything going on around her. She also has the ability to gain the trust of reluctant witnesses who are afraid to speak of what they know. Solving this case was a matter of discovering who was exactly where at a particular time and everyone seems to have the perfect alibi until Miss Silver and Detective Inspector Abbot untangle the truth from the lies. Interesting and diverse characters and a well thought out plot made it entertaining reading although it lacked the sparkle and wit of other contemporary authors like Dorothy Sayers and Ngaio Marsh. I don't think I've read anything by Wentworth, although based on your last paragraph maybe I won't bother. I'm suspending judgement until I've read more - I doubt this one would be considered her best. They're similar in that both are spinsters with a passion for knitting! But whereas Miss Marple relies a lot on intuition, Miss Silver is a professional, works closely with facts and sharing her knowledge with the police. I was interested to read that she actually made her debut in 1928 - before Miss Marple.